We used seagulls (equal size) flying right to create this look. 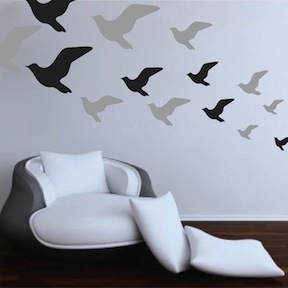 11 birds ranging from 4"-10"
Seagull Bird Wall Decals give any wall the tranquility of the evening sky! Have a blast brightening up your office. Create some memories with your kids while cheering up their room! Seagull Bird Wall Designs are an easy install without the hassle of cleaning a brush, roller, or drop cloth when you’re done! Just a touch of fun is all you need to include! 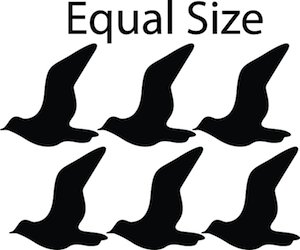 Multi size pack includes (11) birds ranging from 4"-10"
To get multiple color arrangements, place multiple orders of the same Seagull Bird Wall Decals design pack in the colors of your choice and really mix it up! 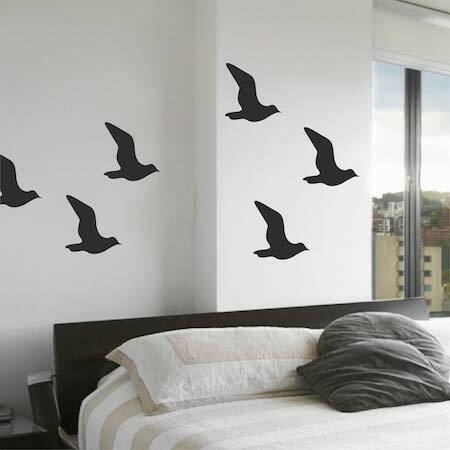 Seagull Bird Wall Decals are made from 100% interior safe, removable vinyl that appears painted right on the walls. Perfect for permanent or temporary decorating. Multiple sizes as well as over 40 different colors are available for all wall decals! 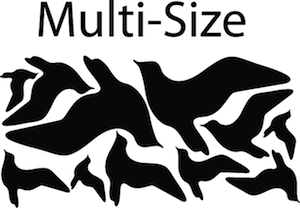 All sizes within a close approximation. 2 word: Reliable & Fast.